The Solar Decathlon challenges 20 college teams from around the globe in 10 contests related to designing, building, and operating the most livable, energy-efficient, and completely solar-powered house. Solar Decathlon houses must power all the home energy needs of a typical family using only the power of the sun. The winner of the competition is the team that best blends aesthetics and modern conveniences with maximum energy production and optimal efficiency. In addition to the team houses, the solar village features energy efficiency and renewable energy exhibits and activities for the visiting public. Houses are open for public tours during the event. 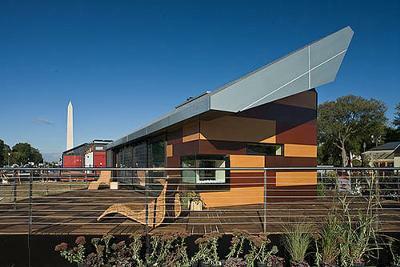 The 2009 Solar Decathlon will take place October 8 - 21 at the National Mall in Washington, D.C. The Solar Decathlon is an educational project of the U.S. Department of Energy (DOE) and is supported by DOE's National Renewable Energy Laboratory and event and team sponsors from the private sector.